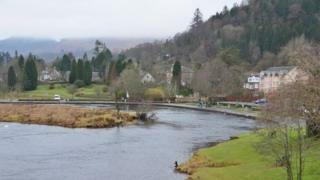 Land close to the River Teith between Callander and Stirling is at risk of being flooded, Sepa has warned. The agency said the waters were expected to peak at about 11:30 on Thursday and would remain high all day. Properties which back onto the Meadows car park in Callander could be flooded, as well as homes and businesses in Gart and Ochtertyre. Low-lying land and farm buildings near the river down the M9 at Stirling are also at risk. Stirling Council warned that the Burn Stewart distillery at Deanston could be flooded as river levels rise, and the A84 near Blair Drummond could be affected as well. The playing fields and an outbuilding at Callander Primary School may also be flooded. A spokesperson for Stirling Council said: "Sepa is currently monitoring the situation and will issue updates as the situation changes. "Despite these warnings, there are no reports of flooding having taken place or any requests for assistance." More information is available on the Sepa website.